The Caribbean Community Climate Change Centre (CCCCC) and its partner the Meteorological Institute (INSMET) in Cuba, conducted a series of training workshops between February 11 and March 14, 2019 to assist Belize with its National Communication to the United Nations Conference on Climate Change (UNFCCC) . The trainings which culminated with a ‘Gender and Communication’ workshop, were held in collaboration with the National Climate Change Office (NCCO) from Ministry of Agriculture, Fisheries, Forestry, the Environment, Sustainable Development and Immigration in Belize and the United Nations Development Programme (UNDP) . The two-day ‘Gender and Communication’ workshop was held from March 13 to 14, at the National Trade Show Grounds’ Agriculture Conference room in Belmopan City. It was facilitated by Mrs. Martha Fernandez, Information and Communication Specialist of the Cuban Institute of Marine Sciences (ICIMAR), and Dr. Elizabeth Miranda, Senior Professor in the Latin American Faculty for Social Sciences (FLACSO), University of Havana. The workshop aimed to build the capacity of Technical Officers from the sectors involved in the 4th National Communication by looking at the various gender integrated approaches, communication strategies and communicative products that were utilized by Cuba’s Third National Communication that can be taken into account for Belize’s National Communication. Climate Modelling consultation and meetings were also held with officers in the agriculture, water, coastal zone and fisheries departments of the Belize government. These meetings were held by the Centre in partnership with the Cuban Institute of Meteorology (INSMET), the National Climate Change Office (NCCO) and the United Nations Development Programme (UNDP) and ran from February 26 to March 1, 2019. The meetings which were held in the Centre’s training room focused on determining the climate modelling data needs for key sectors such as the Water, Agriculture, Coastal Zone and Fisheries sectors to produce sector-specific climate impact maps. These sectors will be investigated as part of Belize’s Sector-Based Vulnerability and Adaptation Assessment which is to be conducted under Belize’s Fourth National Communication and First Biennial Update Report to the UNFCCC Project which is being implemented by the NCCO. The sessions, included consultation with stakeholders and personnel within a sector. A subsequent meeting was held on Friday, March 8, 2019 at the NEMO conference room in Belmopan to build Belize’s capacity and increase the country’s knowledge about climate change to build resilience. Dr. Arnoldo Bezamilla Morlot and Dr. Abel Centella from INSMET, Cuba shared the climate models they developed for the fisheries, water, coastal zone and agriculture sectors based on the previous planning sessions. The meeting concluded with review, feedback and discussion of the outputs of the climate modelling exercise. On February 20, 2019, a “National Communication Partnership Workshop” facilitated by Dr. Eduardo Planos, Director for Cuba’s 3rd National Communication, from INSMET and Dr. Abel Centella, Director of INSMET, was held at the George Price Center for Peace and Development in Belmopan City. The workshop was intended to build the capacity of technical officers from the various relevant Government Ministries and Departments in the area of coastal zone and sea level by focusing on measurement tools, statistical analysis and modelling methods, and community engagement. The workshop was carried out as part of the Fourth National Communication and First Biennial Update Report Project to the United National Framework Convention on Climate Change (UNFCCC) which is being implemented by the National Climate Change Office (NCCO) to supplement existing national activities geared towards building Belize’s Climate Resilience. The workshop was attended by 14 representatives from Institutions including the National Meteorology Service, National Climate Change Office, CCCCC, Ministry of Housing and Urban Development, Ministry of Public Works, National Emergency Management Organization (NEMO), Fisheries Department and National Hydrological Service (NHS). The four-day capacity building “Coastal Zone, Sea Level Rise, and Related Processes” workshop facilitated by Dr. Marcelino Hernández Gonzalez, Cuban Coastal Zone Expert, was held during the period of February 11 – 14 , 2019, at the Coastal Zone Management Authority and Institute’s Conference Room in Belize City. It was made possible through the collaboration of the Centre, NCCO, UNDP and Cuba’s Institute for Marine Sciences (ICIMAR). The purpose of the workshop was to build the capacity of technical officers from the various relevant Government Ministries and Departments on the area of coastal zone and sea level by focusing on measurement tools, statistical analysis and modelling methods, and community engagement. The workshop was carried out as part of the Fourth National Communication and First Biennial Update Report Project to the United National Framework Convention on Climate Change (UNFCCC) which is being implemented by the National Climate Change Office (NCCO) to supplement existing national activities geared towards building Belize Climate Resilience. For more information about the training workshops, contact: Mr. Ahnivar Peralta at aperalta@caribbeanclimate.bz. 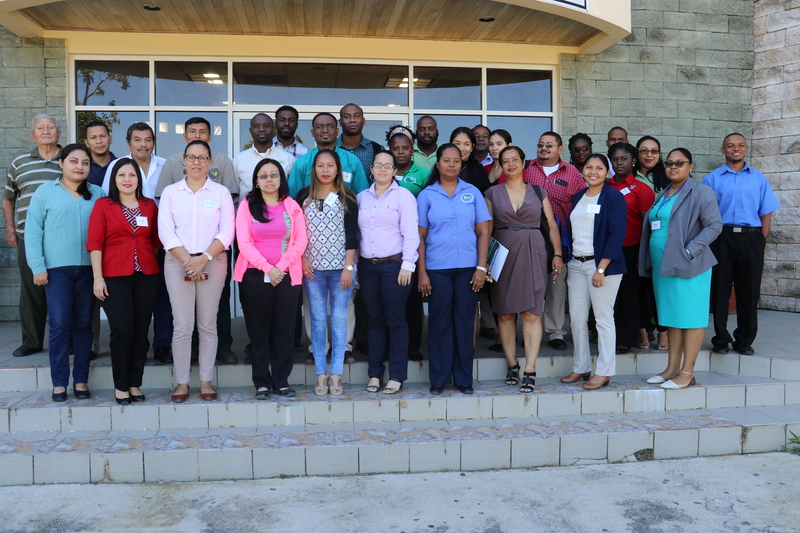 Belmopan, May 10, 2018 – A three-day National Capacity Building on Climate Change Vulnerability and Capacity Assessment (VCA) workshop aimed at enhancing Belize’s ability to measure climate risks, ended today. It was held at the George Price Centre for Peace and Development in Belmopan. The objectives of the workshop are intended to enhance Belize’s national capacity for climate change vulnerability assessments, identify and utilize relevant national, regional and international data resources, tools and models that will provide guidance and information for the VCA. Organisers hoped that the workshop would also help participants to get practical experience in conducting VCAs, identify realistic adaptation activities and actions to address the country’s vulnerabilities and support the national development processes, establish a national network and build communication linkages between practitioners and stakeholders to promote public awareness about climate variability and change, sustainable and economic development, and resilience. The workshop was organsied by the Caribbean Community Climate Change Centre (CCCCC) with funding from The National Climate Change Office (NCCO) under the Ministry of Agriculture, Fisheries, Forestry, the Environment, Sustainable Development and Immigration (MAFFESDI) in collaboration with the Global Environmental Facility(GEF), the United Nations Development Programme (UNDP). Experts from the Cuban Meteorological Institute (INSMET Cuba) and the National Oceanic and Atmospheric Administration (NOAA) presented on concepts and tools used in developing vulnerability and adaptation assessments as well as the various aspects of the Vulnerability Capacity and Adaptation Measures process. Twenty technical experts from various ministries across the government of Belize participated in the various discussions and presented on their conclusions. PRESS RELEASE – Belmopan, Belize; November 24, 2017 – The Caribbean Community Climate Change Centre (CCCCC/5Cs) and the United Nations Development Programme (UNDP) in collaboration with Ministry of Agriculture, Fisheries, Forestry, the Environment and Sustainable Development and Immigration through the National Climate Change Office (NCCO) is hosting a national training on the Caribbean Weather Impacts Group (CARIWIG) Portal and Climate Change Impacts Tools. This training workshop is being funded by the Japan-Caribbean Climate Change Partnership (J-CCCP) project. The training will be held over a period of 9 days; the first segment of the training is scheduled for the week of November 27th to December 1st, 2017, while the second segment will be held from January 15th to 18th, 2018 at the George Price Center, Belmopan City, Belize. Participants of the National Training Workshop, Belize. The Weather Generator (WG), the Tropical Storm Model / Simple Model for the Advection of Storms and Hurricanes (TSM/SMASH), the Caribbean Drought Assessment Tool (CARiDRO) and accompanying web portal and data sets are specific climate change impacts tools aimed at assisting in the generation of scientific information and analysis to help in making informed decisions along with policy formulation and implementation. The tools are open source online resources to provide locally relevant and unbiased climate change information that is specific to the Caribbean and relevant to the region’s development. Case studies focused on areas such as drought, agriculture, water resources, coastal zone structures, health (dengue fever), and urban development and flooding were also done to test these tools and information related to these case studies will be shared during the Training along with many other interactive sessions. The integration of the tools into national policy agendas across the region is being spearheaded through regional and country workshops, which are crucial to ensuring effective decision-making and improving climate knowledge and action. A weather generator has been developed and tested on present day meteorological station observations in the region and found to produce reasonable simulations of both average and extreme weather properties. This tool provides the basis for weather generator based downscaling, required to generate locally relevant bias corrected weather scenarios for impact studies. A new tropical storm model has been developed to provide spatial 15-minute scenarios of rainfall and wind speed over Caribbean islands under various scenarios of track, category, movement speed and historic notable storm. Managers may consider such scenarios as part of hazard management. Case study results suggest that hurricane speed, an under-reported metric, is actually of key importance, and that near-misses may be more hazardous than previously supposed. The CARiDRO tool has been developed to assist the evaluation of meteorological and hydrological drought for the Caribbean and Central American regions, for both present day and future climate projections. This tool greatly simplifies standard but complex analyses and automatically generates a number of graphical outputs (e.g. time series plots and maps). This tool will support the agriculture and water resource sectors in their assessment and adaptation to drought hazard. A case study verified the CARiDRO tool identification of a region-wide historic drought, and found that future projections indicated increasing regional drought frequency. PRESS RELEASE – Port-of-Spain: October 9, 2017: When scientists and researchers meet in Trinidad at the International Climate Change Conference for the Caribbean this week, it will be in the aftermath of the devastation wrought in the region by successive monster storms in the current 2017 Hurricane Season. The conference, which is being hosted by the Caribbean Community Climate Change Centre (CCCCC) in association with the European Union (EU) funded Global Climate Change Alliance Plus Initiative (GCCA+) runs from October 9 to 12. It brings together regional scientists to update regional stakeholders on the ongoing regional research in climate change, inform on actions being undertaken to build climate resilience across the region by regional and international organisations, and discuss issues related to climate finance and the science, policy and finance nexus. Scientists will present the key findings of the 1.5 to Stay Alive research project for the Caribbean region, which was funded by the Caribbean Development Bank. This should offer more insight into the consequences of global warming exceeding a 1.5 degree Centigrade threshold and provide our regional climate change negotiators with a more robust science-based platform for further insisting at the forthcoming Conference of Parties (COP) at the United Nations Framework Convention of Climate Change (UNFCCC) that global mitigation efforts need to be scaled up so that global warming does not exceed this threshold. The meeting is being held under the theme “Adaptation in Action” which CCCCC’s Deputy Executive Director and Science Advisor Dr. Ulric Trotz said because this best describes the focus of regional institutions and countries in the face of threats posed by Climate Change. “The 2017 Hurricane Season shows us that we must be proactive in building resilience in the small nation states of the region. And while adaptation and mitigation are critical, climate financing is a much-needed lifeline if the region is to successfully pursue a low carbon climate resilient development pathway. We cannot survive unless we are able to build to withstand these super storms,” he said. Climate negotiators and Inter-governmental Panel on Climate Change (IPCC) Focal Points from across the region are also in attendance. Other sponsors include the Caribbean Development Bank (CDB), United Nations Development Programme Japan-Caribbean Climate Change Partnership (UNDP J-CCCP) and Food and Agriculture Organisation of the United Nations (FAO). While some work on reef gardens and strategies to repopulate over fished areas, others crunch the data and develop tools designed to prepare the region, raise awareness of climate change issues and provide the information to help leaders make decisions. As the oceans absorb more carbon, the region’s supply of conch and oysters, the mainstay of some communities, is expected to decline further. In December 2017, the Caribbean Regional Fisheries Mechanism (CRFM) secretariat, with funding from the UK government, announced a Climate Report Card to help formulate strategies to lessen the impact of climate change on regional fisheries. “The CRFM is trying to ensure that the issue of climate change as it relates to the fisheries sector comes to the fore… because the CARICOM Heads of Government have put fish and fishery products among the priority commodities for CARICOM. It means that things that affect that development are important to us and so climate change is of primary importance,” said Peter Murray, the CRFM’s Programme Manager for Fisheries and Development. The grouping of small, developing states are ‘fortifying’ the sectors that rely on the marine environment, or the Blue Economy, to withstand the expected ravages of climate change which scientists say will increase the intensity of hurricanes, droughts, coastal sea level rise and coral bleaching. In its last report AR5, the Intergovernmental Panel on Climate Change (IPCC) reported: “Many terrestrial, freshwater and marine species have shifted their geographic ranges, seasonal activities, migration patterns, abundances and species interactions in response to ongoing climate change,” patterns that are already being noted by Caribbean fishers. In an email to IPS, Murray outlined several initiatives across the Caribbean that ,he says are crucial to regional efforts. The Report Card, which has been available since March, will provide the in-depth data governments need to make critical decisions on mitigation and adaptation. It provides information covering ocean processes such as ocean acidification; extreme events like storms, surges and sea temperature; biodiversity and civil society including fisheries, tourism and settlements. In addition, the 17-members of the CRFM agreed to incorporate the management of fisheries into their national disaster plans, and signed off on the Climate Change Adaptation and Disaster Risk Reduction Strategy for the fisheries sector. “It means that anything looking at climate change and potential impacts is important to us,” Murray says. The IPCC’s gloomy projections for world fisheries has been confirmed by a 2015 World Wildlife Fund (WWF) report indicating that for the last 30 years, world fisheries have been in decline due to climate change. In the Caribbean, reduced catches are directly impacting the stability of entire communities and the diets and livelihoods of some of the region’s poorest. 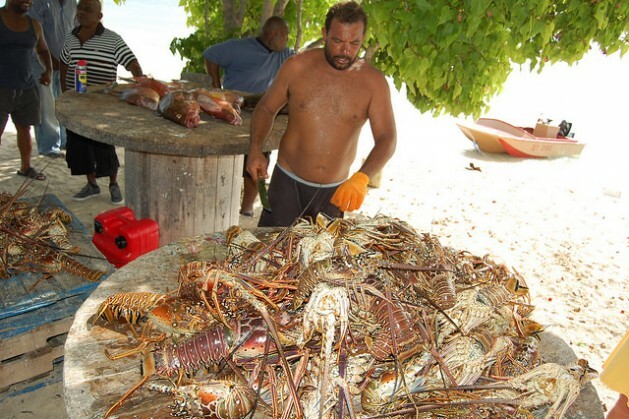 Further decline could devastate the economies of some islands. But even as climate change is expected to intensify the effects of warming ocean waters, pelagic species could avoid the Caribbean altogether, bringing even more hardships. So the regional plan is centred on a Common Fisheries Policy that includes effective management, monitoring and enforcement systems and tools to improve risk planning. In addition to the disaster plan and its other activities, the Community has over time installed a Coral Reef Early Warning System; new data collection protocols; improved computing capacity to crunch climate data; an insurance scheme to increase the resilience of fishing communities and stakeholders; as well as several tools to predict drought and excessive rainfall. Worldwide, three billion people rely on fish as their major source of protein. The industry provides a livelihood for about 12 per cent of the world’s population and earns approximately 2.9 trillion dollars per year, the WWF reports. With regional production barely registering internationally, the Caribbean is putting all its efforts into preserving the Blue Economy, which the World Bank said earned the region 407 billion dollars in 2012. The Caribbean Community Climate Change Centre, known regionally as the 5Cs, has coordinated and implemented a raft of programmes aimed at building systems that will help the region cope the effects of climate change. Through collaboration with the US National Oceanic and Atmospheric Administration (NOAA), the 5Cs has been setting up an integrated network of climate and biological monitoring stations to strengthen the region’s early warning mechanism. And as the oceans absorb more carbon, the region’s supply of conch and oysters, the mainstay of some communities, is expected to decline further. In addition, warming sea water is expected to shift migration routes for pelagic fish further north, reducing the supply of available deep sea fish even more. Added to that, competition for the dwindling resources could cause negative impacts of one industry over another. But while scientists seek options, age-old traditions are sometimes still pitted against conservation projects. Take an incident that played out in the waters around St. Vincent and the Grenadines a few weeks ago when whale watchers witnessed the harpooning of two orcas by Vincentian fishermen. The incident forced Prime Minister Ralph Gonsalves to announce the end of what was, until then, a thriving whaling industry in the village of Barouille. For years, government turned a blind eye as fishermen breached regional and international agreements on the preservation of marine species. The continued breaches are also against the Caribbean Community’s Common Fisheries Policy that legally binds countries to a series of actions to protect and preserve the marine environment and its creatures. On April 2, five days after the incident, Gonsalves took to the airwaves to denounce the whaling caused by “greed” and announce pending regulations to end fishing for the mammals. The incident also tarnished the island’s otherwise excellent track record at climate proofing its fishing industry. Murray’s email on regional activities outlines SVG activities including the incorporation of the regional strategy and action plan and its partnership with several regional and international agencies and organisations to build resilience in the marine sector. Over in the northern Caribbean, traditions are also testing regulations and international agreements. In Jamaica, the Sandals Foundation in association with major supermarket chains has launched a campaign to stop the capture and sale of parrotfish for consumption. Scientists say that protecting the parrotfish is synonymous with saving the reefs and mitigating the effects of climate change. And further north in the Turks and Caicos, the government is searching for new ways to manage the conch and lobster populations. While trade is regulated, household use of both, sea turtles, and some sharks remain unregulated; and residents are resistant to any restrictions. And while many continue to puzzle about the reasons behind the region’s climate readiness, scientists caution that there is no time to ease up. This week they rolled out, among other things, a coastal adaptation project and a public education and awareness (PAE) programme launched on April 26 in Belize City. The PAE project, named Feel the Change, is funded by the United Nations Development Programme (UNDP) and Japan-Caribbean Climate Change Project (J-CCCP) public awareness programme. Speaking at the launch, project development specialist at 5Cs, Keith Nichols, pointed to the extreme weather events from severe droughts to changes in crop cycles, which have cost the region billions. “Climate change is not just sea level rise and global warming; climate change and climate variability is all around us,” he said. The Belize Ministry of Agriculture, Fisheries, Forestry, Environment and Sustainable Development hosted a 1 day workshop earlier in March, 2016, at the Best Western Belize Biltmore Plaza Hotel under a project entitled “Capacity-building for the strategic planning and management of natural resources in Belize”. This project is being implemented in collaboration with the United Nations Development Programme, with funding from the Global Environment Facility, and aims to facilitate sustainable development as we seek to manage and adapt to the effects of climate change. The concept of a low carbon development strategy came up at the United Nations Climate Change Conference in Cancun in 2010 where developing countries such as Belize were encouraged to pursue development with minimal outputs of greenhouse gas emissions and at the same time prepare for its impacts. A Low Carbon Development Roadmap was prepared for Belize in 2015 during which the consultancy identified and analyzed challenges and gaps with regard to low carbon development in the country. The Low Carbon Development Roadmap will strategically assist the country to follow a low-carbon economy path in order to achieve sustainable development, based on local socio-economic and development priorities. During the first roadmap consultations, low carbon development alternatives in the Agriculture, Forestry, Energy, Tourism and Transport sectors were analyzed. Citing two examples, improved farming practices will enable farmers to be more resilient as well as reduce agricultural emissions; and energy efficiency and renewable energy solutions can minimize carbon emissions while at the same time contribute to poverty reduction. It is against this backdrop, the capacity gap assessment workshop was held. The workshop aimed at revising the Roadmap, to align the roadmap to the Growth and Sustainable Development strategy in a more coordinated, coherent and strategic manner and to identify the main capacity gaps. South Pole Carbon Asset Management Ltd. had prepared the Low Carbon Development Roadmap and was contracted by the Ministry of Agriculture, Fisheries, Forestry, Environment and Sustainable Development to undertake this initiative. Key stakeholders from regional organizations, as well as from the public and private sectors, were invited to allow for focused discussions, and to contribute of their knowledge and experience. The outcome of this workshop will be a new version of the Low Carbon Development Roadmap that will incorporate the feedback from the stakeholders and will be aligned to the Growth and Sustainable Development Strategy to ensure coherence and integration between climate change, growth and sustainable policy framework. The government of Japan and the United Nations Development Programme (UNDP) launched the US$15 million Japan-Caribbean climate change partnership (J-CCCP) on Thursday, in line with the Paris Agreement on Climate Change, to keep global warming below 2 degrees Celsius and to drive efforts to limit the temperature increase even further to 1.5 degrees Celsius above pre-industrial levels. The launch follows a two-day meeting with more than 40 representatives from eight Caribbean countries, including government officials, technical advisors, NGO and UN partners to set out a roadmap to mitigate and adapt to climate change, in line with countries’ long-term strategies. The new initiative will help put in practice Caribbean countries’ actions and policies to reduce greenhouse gas emissions and adapt to climate change, such as nationally appropriate mitigation actions (NAMAs) and national adaptation plans (NAPs). It will also boost access to sustainable energy and help reduce fossil fuel imports and dependence, setting the region on a low-emission development path, while addressing critical balance of payments constraints. “The government of Japan is pleased to partner with UNDP. It is envisaged that the project will also contribute to building a platform for information sharing in developing and implementing climate change policies and promoting the transfer of adaptation and mitigation technologies. Japan expects, through pilot projects and information sharing, the project will enable the Caribbean countries to enhance their capacity to cope with climate change and natural disasters,” said Masatoshi Sato, minister-counsellor and deputy head of mission at the embassy of Japan in Trinidad and Tobago, stressing that the partnership will also promote South-South and North-South cooperation, including study tours to Japan for government officials and technical advisors. Participating countries include Belize, Dominica, Grenada, Guyana, Jamaica, Saint Lucia, St Vincent and the Grenadines, and Suriname, benefitting an estimated 200,000 women and men in 50 communities. Climate change is recognised as one of the most serious challenges to the Caribbean. With the likelihood that climate change will exacerbate the frequency and intensity of the yearly hurricane season, comprehensive measures are needed to protect at-risk communities. Boosting resilience is crucial for the region’s development and is a clear part of UNDP’s global strategic plan of programme priorities. Negative impacts on land, water resources and biodiversity associated with climate change have also been predicted with the potential to affect shoreline stability, the health of coastal and marine ecosystems and private property, as well as ecosystem services. Increasing coastal erosion and severe coral reef bleaching events are already evident in some locations. This achievement should be celebrated, especially by Small Island Development States (SIDS), a 41-nation group—nearly half of them in the Caribbean—that has been advocating for increased ambition on climate change for nearly a quarter century. SIDS are even more vulnerable to climate change impacts — and risk losing more. Global warming has very high associated damages and costs to families, communities and entire countries, including their Gross Domestic Product (GDP) according to the Intergovernmental Panel on Climate Change. What does this mean for the Caribbean? Climate change is recognized as one of the most serious challenges to the Caribbean. With the likelihood that climate change will exacerbate the frequency and intensity of the yearly hurricane season, comprehensive measures are needed to protect at-risk communities. Moreover, scenarios based on moderate curbing of greenhouse gas emissions reveal that surface temperature would increase between 1.2 and 2.3 °C across the Caribbean in this century. In turn, rainfall is expected to decrease about 5 to 6 per cent. As a result, it will be the only insular region in the world to experience a decrease in water availability in the future. The combined impact of higher temperatures and less water would likely result in longer dry periods and increased frequency of droughts, which threaten agriculture, livelihoods, sanitation and ecosystems. Perhaps the most dangerous hazard is sea level rise. The sea level may rise up to 0.6 meters in the Caribbean by the end of the century, according to the Intergovernmental Panel on Climate Change. This could actually flood low-lying areas, posing huge threats, particularly to the smallest islands, and impacting human settlements and infrastructure in coastal zones. It also poses serious threats to tourism, a crucial sector for Caribbean economies: up to 60 per cent of current resorts lie around the coast and these would be greatly damaged by sea level increase. Sea level rise also risks saline water penetrating into freshwater aquifers, threatening crucial water resources for agriculture, tourism and human consumption, unless expensive treatments operations are put into place. In light of these prospects, adapting to climate change becomes an urgent necessity for SIDS—including in the Caribbean. It is therefore not surprising that all Caribbean countries have submitted a section on adaptation within their Intended Nationally Determined Contributions (INDCs), which are the voluntary commitments that pave the way for the implementation of the Paris Agreement. In their INDCs, Caribbean countries overwhelmingly highlight the conservation of water resources and the protection of coastal areas as their main worries. Most of them also consider adaptation initiatives in the economic and productive sectors, mainly agriculture, fisheries, tourism and forestry. The United Nations Development Programme (UNDP) has been supporting Caribbean countries in their adaptation efforts for many years now, through environmental, energy-related and risk reduction projects, among others. This week we launched a new partnership with the Government of Japan, the US$15 million Japan-Caribbean Climate Change Partnership (J-CCCP), in line with the Paris Agreement on Climate Change. The initiative will be implemented in eight Caribbean countries: Belize, Dominica, Grenada, Guyana, Jamaica, Saint Lucia, Saint Vincent and the Grenadines, Suriname, benefitting an estimated 200,000 women and men in 50 communities. It will set out a roadmap to mitigate and adapt to climate change, in line with countries’ long-term strategies, helping put in practice Caribbean countries’ actions and policies to reduce greenhouse as emissions and adapt to climate change. It will also boost access to sustainable energy and help reduce fossil fuel imports and dependence, setting the region on a low-emission development path, while addressing critical balance of payments constraints. When considering adaptation measures to the different impacts of climate change there are multiple options. Some rely on infrastructure, such as dikes to control sea level rise, but this can be particularly expensive for SIDS, where the ratio of coastal area to land mass is very high. In this context, ecosystem-based adaptation activities are much more cost-effective, and, in countries with diverse developmental priorities and where financial resources are limited, they become an attractive alternative. This means healthy, well-functioning ecosystems to boost natural resilience to the adverse impacts of climate change, reducing people’s vulnerabilities as well. UNDP, in partnership with national and local governments in the Caribbean, has been championing ecosystem-based adaptation and risk reduction with very rewarding results. For example, the Government of Cuba partnered with UNDP, scientific institutes and forestry enterprises to restore mangrove forests along 84 km of the country’s southern shore to slow down saline intrusion from the sea level rise and reduce disaster risks, as the mangrove acts as a protective barrier against hurricanes. In Grenada, in coordination with the Government and the German International Cooperation Agency, we supported the establishment of a Community Climate Change Adaptation Fund, a small grants mechanism, to provide opportunities to communities to cope with the effects of climate change and extreme weather conditions. We have engaged with local stakeholders to develop climate smart agricultural projects, and climate resilient fisheries, among other activities in the tourism and water resources sectors. UNDP’s support is directed to balance social and economic development with environmental protection, directly benefitting communities. Our approach is necessarily aligned with the recently approved 2030 Sustainable Development Agenda and its associated Sustainable Development Goals, delivering on protecting ecosystems and natural resources, promoting food security and sanitation, while also helping reduce poverty and promoting sustainable economic growth. While there is significant potential for climate change adaptation in SIDS, it will require additional external resources, technologies and strengthening of local capacities. In UNDP we are ideally placed to continue working hand-in-hand with Caribbean countries as they implement their INDCs and find their own solutions to climate-change adaptation, while also sharing knowledge and experiences within the region and beyond. Jessica Faieta is United Nations Assistant Secretary General and UNDP Regional Director for Latin America and the Caribbean. The Caribbean Community (Caricom), Japan and the United Nations Development Programme (UNDP) will launch the US$15-million Japan-Caribbean Climate Change Partnership (J-CCCP) that will bring together policymakers, experts and representatives of affected communities to encourage policy innovation for climate technology incubation and diffusion. A UNDP statement said that the launch is in “tandem with the recent agreement by world leaders at the Paris Climate Conference to keep global warming below 2 degrees celsius, and further to pursue below 1.5o degrees celsius in order to avoid negative impacts to the Caribbean”. It said that the new initiative aims to ensure that barriers to the implementation of climate-resilient technologies are addressed and overcome in a participatory and efficient manner. Thursday’s launch will be addressed by Rebeca Arias, director, UNDP Panama Regional Hub, Masatoshi Sato, minister-counsellor and deputy head of mission at the Trinidad-based Embassy of Japan, and Stephen O’Malley, resident representative, UNDP Subregional Office for Barbados and the Organisation of Eastern Caribbean States. The new Japan-Caribbean-UNDP Partnership will boost national policies and plans to cope with climate change-related adversity, also aiming to reduce dependency on fossil fuel imports, setting the region on a low emission path and improving access to sustainable energy.